Instruction tools and classes leverage expert instructors to teach the curriculum through engaging lectures and exam-based applications. Attend live classes online from anywhere in the world via the Internet or take part in our live classroom courses in select cities throughout the world. Whichever course delivery method you choose, our expert faculty will guide you through the CFA Program curriculum with a structured approach to help you prepare for the exam. All of our live online classes are archived, so you can start, stop, and rewind at your own pace for additional review. To learn more about our Weekly Class offerings, click here. 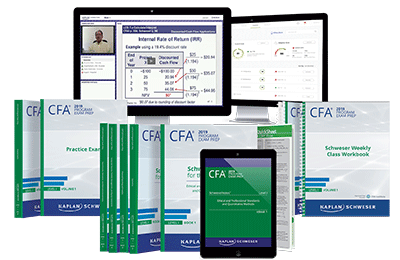 Schweser On-Demand Video Classes include more than 40 hours of instruction that thoroughly cover every topic of the CFA Program curriculum. Start preparing for the exam on the topic of your choice and view each lesson or segment as often as you like. Expert instructors will help you master difficult concepts, theories, and techniques necessary for success on exam day.